This knit dress is the “1 pattern 5 ways” for this issue, but god knows why they make them all in such garish prints – I’d love to see how that great tech drawing translates into the finish dress, but I can’t make it out through the prints! 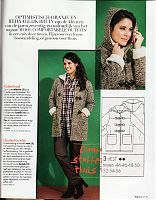 In the Plus section, I just love this duffle coat! So, all in all, an okay issue, but it doesn’t make me regret cancelling my subscription. Like cookies, it appears that KnipMode is “a sometimes food”! Separator image Posted in In Progress and tagged with knipmode, magazine.